NVIDIA's R&D spending has grown significantly over the years. Graphics specialist NVIDIA (NASDAQ:NVDA) has seen a tremendous amount of success over the last several years. The company's revenue and profit have surged, leading to massive appreciation in its share price over the last six years. NVIDIA Revenue, Operating Income, and Stock Performance: data by YCharts. As the company has enjoyed that financial success, it has also taken the opportunity to significantly grow its spending on research and development (R&D). In its most recent annual filing, NVIDIA explains that its "research and development efforts include software engineering, including efforts related to the development of our CUDA platform, hardware engineering related to our GPUs, Tegra processors, and systems, very large scale integration design engineering, process engineering, architecture and algorithms." Here, I'd like to go over how the company's R&D spending has trended over the last several years and take a peek at how efficient that spending has been. Source: NVIDIA fiscal year 2018 10-K filing. Chart by author. Between fiscal year 2016 and fiscal year 2018, NVIDIA has boosted its R&D spending by about $470 million, or roughly 35%. 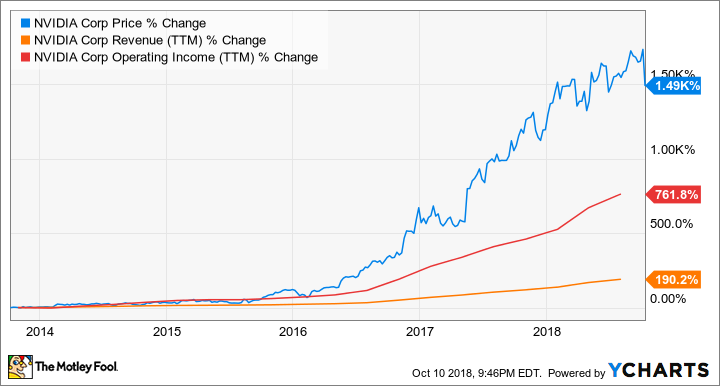 NVIDIA's current fiscal year -- that's fiscal year 2019 -- isn't over yet, but during the first two quarters of the year, NVIDIA has continued to grow its R&D spending at a fast pace. In fact, during the first half of fiscal year 2019, NVIDIA has already spent $1.12 billion on research and development -- up almost 36% from the first half of fiscal year 2018. In its most recent quarterly filing, NVIDIA said that this spending was "driven primarily by employee additions and increases in employee compensation and other related costs, including stock-based compensation expense." Interestingly, NVIDIA's R&D spending growth accelerated from almost 32% in the first quarter of fiscal year 2019 to just shy of 40% in the second quarter of the fiscal year. Is NVIDIA keeping spending in check? It's important for tech companies to make sure that they're properly funding their research and development efforts. After all, that spending is fundamentally what allows these companies to build products and technologies that people want to buy, ultimately fueling their revenues and profits. At the same time, it's also worth keeping tabs on a company's R&D spending as a percentage of revenue to get some sense of how efficient that R&D organization is. NVIDIA R&D to Revenue (TTM), data by YCharts. TTM = trailing 12 months. 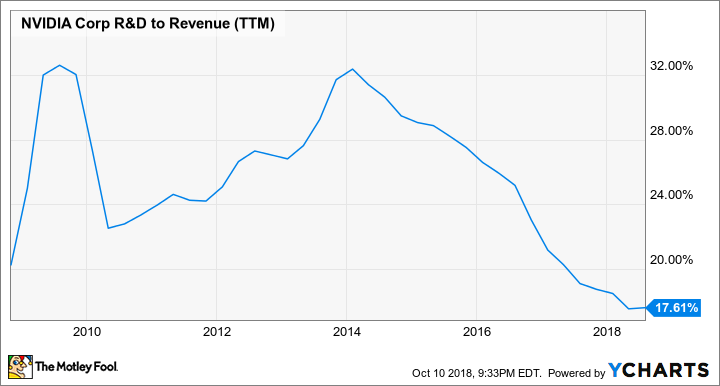 Even though NVIDIA's R&D budget has surged in recent years, the ratio of the company's research and development spending to revenue has actually declined significantly since 2014. This tells us that the company's revenue growth has dramatically outpaced the growth in its R&D spending, pointing to an organization that's managing to wring out a lot of business success from the R&D dollars that it does spend.